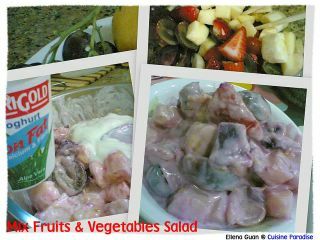 In order to make it a more filling dish, I add in some Japanese Purple Potato and Potato together with some Mayo and Aloe Vera Yoghurt. You can add in whatever fruits or vegetables that you had in your kitchen pantry instead of what I am using. 1. Wash and remove the skin of the potato and sweet potato then steam over medium heat until tender. 2. 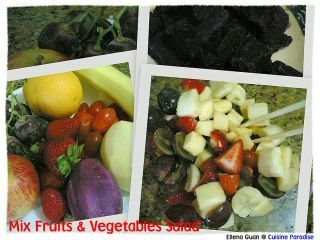 In the meantime, wash and cut the rest of the fruits into cubes then put in a big mixing bowl. 3. Cool the cooked sweet potato and potato then cut into cubes and add into the rest of the fruit. 4. Pour in the Aloe Vera Yoghurt and Mayonnaise Suace then mix well with the fruits until well combined and chilled in the fridge until serve. Notes: You can used any type of favour yoghurt that you prefer. Went to Delifrance for breakfast a few days ago. 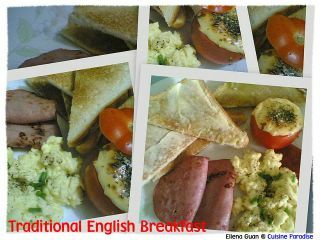 I order one of their Traditional English Breakfast which cost about $6.50 for Scrambled Eggs or Sunny Side Up + 2 Slices Turkey Ham + 1 Tomato Provencal & Duchess Potato + 1/4 Baguettet and served with coffee/tea. 1. Heat up a non-stick pan with some olive oil then pan-fry the ham on both side for a few second and dish up. 2. Beat the eggs with fresh milk and cream together with some salt and pepper until well combined. 3. Heat up the pan with some butter and pour in the egg mixture, keep stirring until you get the scrambled egg texture to your preference. 4. Cut of the top off from the 2 tomatoes and top with half slice of cheese each. Sprinkle with some Italian herbs and bake for about 10 minutes. 5. Toast the bread and spread with some butter or jam and place on the plate with the rest of the ingredients and serve with coffee or tea for a hearty breakfast. 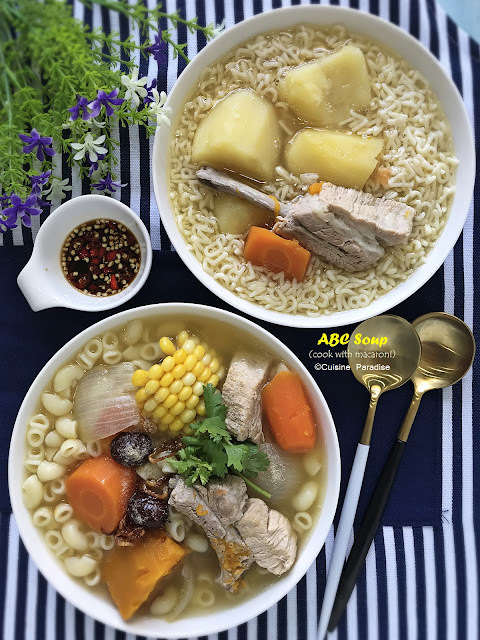 This is a very soothing and nutritious soup which required very little ingredients such as either Lean Pork or Chicken Drumsticks together with some White Fungus, Wooden Ear and Red Dates. Due to the long hours of boiling, the texture of the soup will be sort of sticky rather than those normal clear soup. The texture is fragrant and refreshing due adding a few slices of ginger. 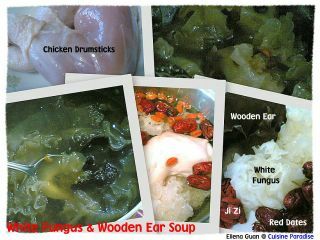 Wooden Ear(黑木耳): This contain much protein, carotene, vitamins A & B. It also improves blood circulation, benefits the spleen, moisturizes the lungs. White Fungus(雪耳): It tastes slightly sweet and of neutral nature. It benefits the spleen, strengthens the stomach and expel Dryness. It calms the spirit, treats insomnia and is good for the body type that resists beneficial food. 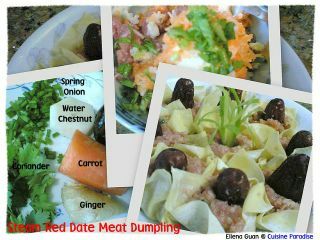 Red Date(红枣): It is a blood tonic which can be widely used with other ingredients to nourish the body. This soup helps to prevent blood vessel blockage, reduce cholesterol level, reduce blood pressure, avoids stroke and arteriosclerosis. Other then that it also helps reduce spot appearance, cleanse and moisturize the skin. 1. Soak white fungus and wooden ear in water until soft. 2. Remove the stems, rinse well and tear into small pieces and scald then set aside. 3. Rinse and scald the chicken. 4. Crush the red dates with flat side of knife, remove the seeds and rinse well. 5. Boil 1.5 – 2 Litres of water to boil, then add in all the ingredients and boil for 10 minutes. 6. Transfer to a slow cooker and simmer on low heat for about 3 – 4 hours. Notes: You can either used Chicken or Lean Pork for this recipe. 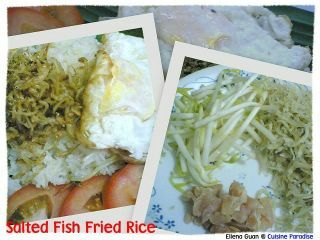 Just wanted to have something simple for dinner, so I decided to make this Salted Fish Fried Rice. It's very simple and only required Salted Fish and Rice as the Main Ingredients. 2. Wash and drain the bean sprout and dired whitebaites. 3. Heat the non-stick pan with 1/2 tablespoon of oil and pan-fry the whitebaits until golden brown and crisp then season with some salt and sugar, then remove and set aside. 4. Add in another 1 tablespoon of oil then pan-fry the salted fished until crisp and fragrant then add in the minced garlic and bean sprout. 5. Give a quick stir through then add in the cold rice and stir over medium heat until the rice is in separate grains. 6. Add in some cooking wine and fish sauce(light soya sauce) for seasoning then sever warm with fried whitebaits and egg. This Steamed Red Date Meat Dumpling is inspired by one of the economical rice stall (cai fan - 菜饭) near my area. I find this dish rather interesting whiling ordering our usual dishes so I decide to try it out. And after trying I thought maybe I can replicate it using similar ingredients base of what I eaten. Wanted to try cooking this soup for a very long time. 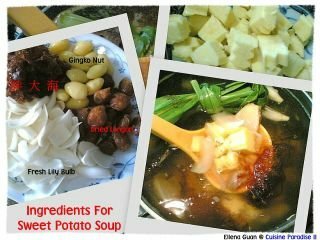 Usually you can in different kinds of ingredients to into this soup. Some prefer to have some extra herbs into it while other might not so it all depend on what you prefer to eat. 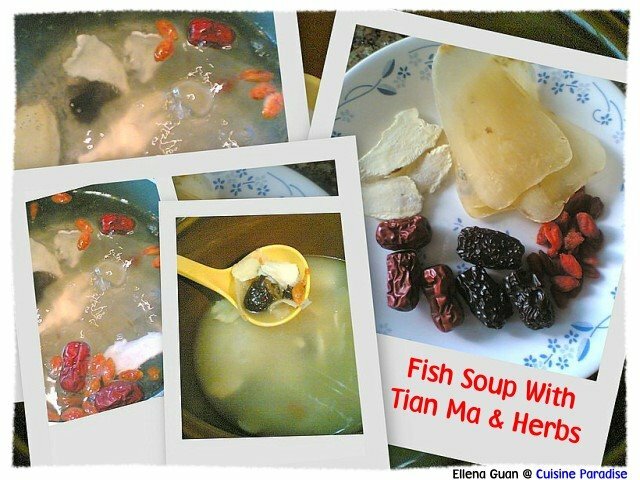 Today what I had cooked is just the mini version because I had omitted things like Abalone, Fish Maw, Ham and etc. What I had is mainly on the dried ingredients and herbs, which is cheaper and easily found in your kitchen pantry. 1. Wash and soak dried oysters and scallop in hot water until soft, then rinse well. 2. Wash all the rest of the herbs and set aside for later use. 3. Wash and blanched the pork ribs and chicken in boiling water then rinse well. 4. Bring a pot of water(about 1.5 litres) to boil then add in all the herbs, chicken and pork ribs and bring to boil again. 5. Wash the sea cucumber and cut into thick section then set aside. 6. Transfer to a slow cooker and simmer on low heat for about 3 - 4 hours then add in the sea cucumber and continue to simmer for another 30 minutes. 7. Season with salt to taste and serve. 1. 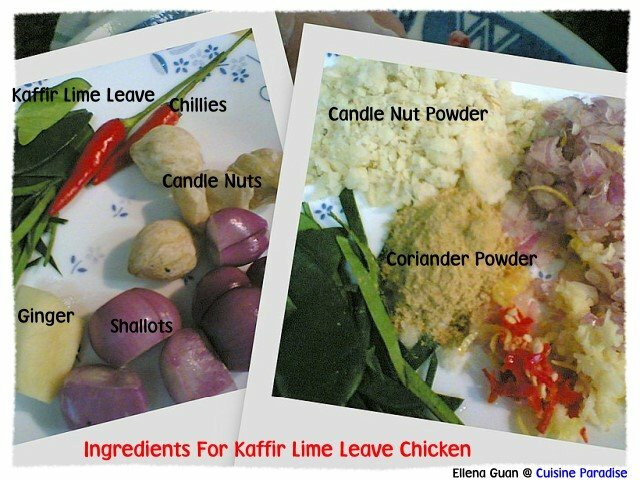 Heat the oil in a non-stick pan, stir fry all the spices ingredients and the kaffir lime leaves until fragrant. 2. Add chicken and stir-fry for another 2 - 3 minutes or until slightly brown. 3. 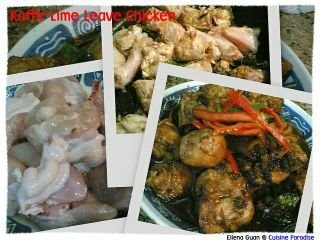 Pour in the kecap manis, allow to caramelise then add in about 50ml of water and cook until the chicken is tender. 4. Garnish it with extra shredded Kaffir Lime Leaves and Chillies and serve with rice. Notes: You can also used chicken fillets or any other parts of the chicken for this dish. Kecap Manis can be found in any local supermarket like NTUC or Cold Storage under the sauce department. Had being feeling unwell for the past one week due to Fever, Diarrhea, Sore Throat and etc…. So I really don’t have much time and effort to whip up any meals. Today I decided to clear away the Button Mushroom, Japanese Cucumber, Cherry Tomatoes and some fruits that I bought last week. At first, I was thinking of cooking Spaghetti with these ingredients but later I switch my mind to a more complete rice meal serve with Mixed Fruits & Vegetables Salad. 1. Marinate the pork mince with some pepper, light & dark soya sauce, cornflour and sesame oil then set aside for later use. 2. Wash the Dried Whitebaits and drained well then use some kitchen paper towel to absord the water. 3. Add about 1/2 Tablespoon of oil in a non-stick pan the stir-fry the whitebaits until golden brown. Season with some salt and suagr for taste. 4. Heat up another 1 Tablespoon of oil in the pan, add in the chopped onion and saute until it's became soft and slightly brown then add in the pork mince. 5. Stir-fry until it's fragrant and almost done then add the button mushroom and stir for another 2 minutes then pour in Rice Wine or Water and continue to simmer until sauce thicken. 6. Dish up and place ontop of the rice, top with cripsy Dried Whitebaits, egg or etc and serve. Had being feeling very tired and restless during these past few weeks, so decided to double-boiled this American Ginseng Honey Tea. 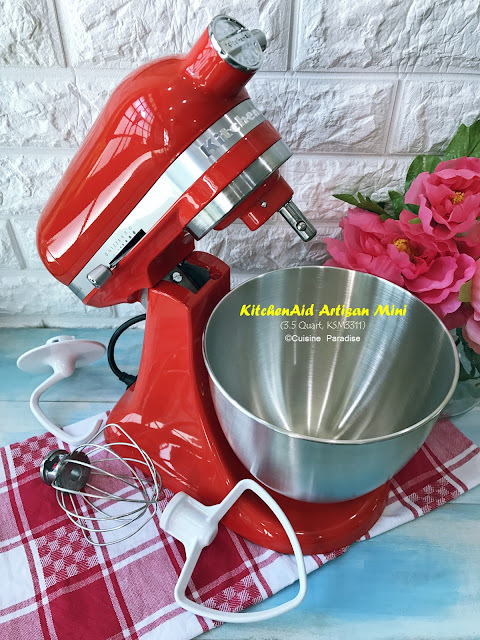 It is very simple and only required a few ingredients. This drink can calm spirits and nerve as well as cure insomnia. American Ginseng(花旗参): It is sweet in taste, with a hint of bitterness and cool in nature. It nourishes the Yin energy in the lungs, clears Asthenic Fire, benefit the Stomach and promotes secretion of body fluid. It mainly treats Dryness of Lungs and Stomach and dire thirst and Qi, therefore strengthens the internal organs. Dried Longan(桂圆肉): Tastes sweet and of neutral nature. It nourishes the heart and the spleen, benefits bloods and calms the spirit. It works well for treating tensions, palpitation, insomnia and forgetfulness. 1. 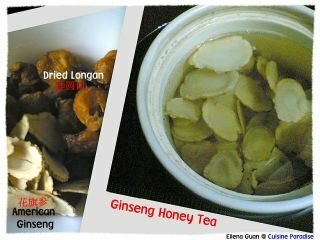 Soak the American Ginseng and Dried Longan in hot water for 1-2 minutes then drain. 2. Put all the ingredients except honey in a small double-boiler pot in a slow-cooker and double-boiled for about 2 hours on low heat. 3. Add in honey then continue to double-boiled for another 15 minutes and serve warm before bedtime. Notes: When taking this drink it is best that you don't eat any dish or soup that contain raddish or beans for 1 - 2 days, because chinese belived that raddish will drain and absord all the good source from the Ginseng. This afternoon, I decided to make some sweet soup for dessert so I cook this Sweet Potato Soup with fresh lily bulbs, gingko nuts and sterculia seeds. Fresh Lily Bulbs, Ginkgo Nut and Sterculia Seeds. For your information, sterculia seed (澎大海) is actually one of the commonly ingredients found in Cheng Teng (清汤). Have you heard or seen a Sea Conch before? Do you know Sea Conch (响螺片): has a sweet taste and of cold nature. It helps to clear the liver, nourishes lungs and benefits the organs. 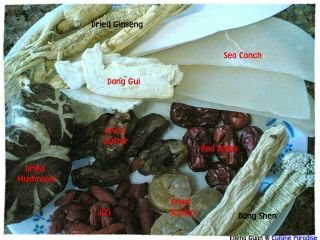 And according to Chinese Physician those who suffer from weak QI energy and anaemia will benefit a lot from drinking sea conch soup. 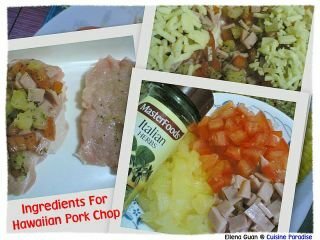 Hawaiian Pork Chop! You must be surprised to see this combination of ham and pineapple on pork chop rather than pizza. I must assure you this taste really good especially with sketching cheese on it. So if you are a pizza lover, this is a quick weeknight dish for you. Just assemble everything and off it goes into the oven while you can go and take a shower before dinner. 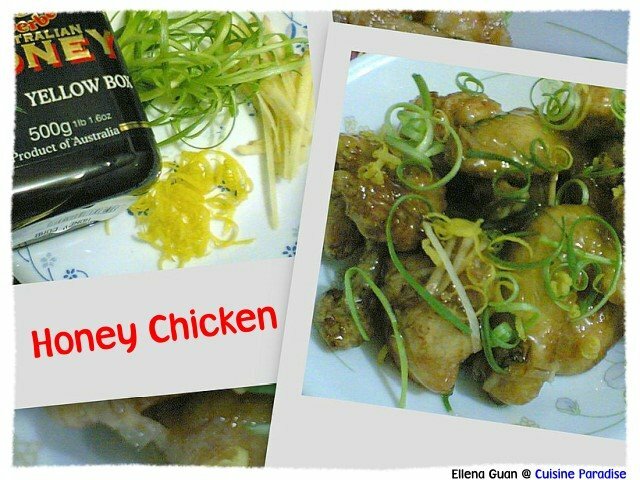 Today while getting some groceries in the supermarket I saw this interesting Honey Chicken recipe from one of the recipe cards on shelf. And since I have most of the ingredients at home, I decided to grab some chicken meat and try out the recipe. 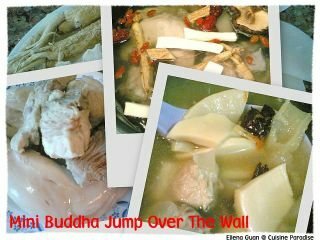 I always want to learn and cook those double-boiled soup sold in Chinese restaurant or herbal soup stall such as "Lotus and Pork Ribs Soup", old cucumber soup, ginseng chicken and etc. 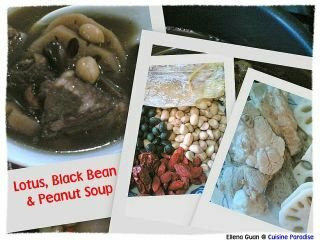 For this soup I added some black beans, peanut and cuttlefish which brings out more intense flavour and the cuttlefish definitely help to add bonus points to the soup. Since I still have some left over Kai Lan from cooking the Mix Vegetable Alphabets Pasta. 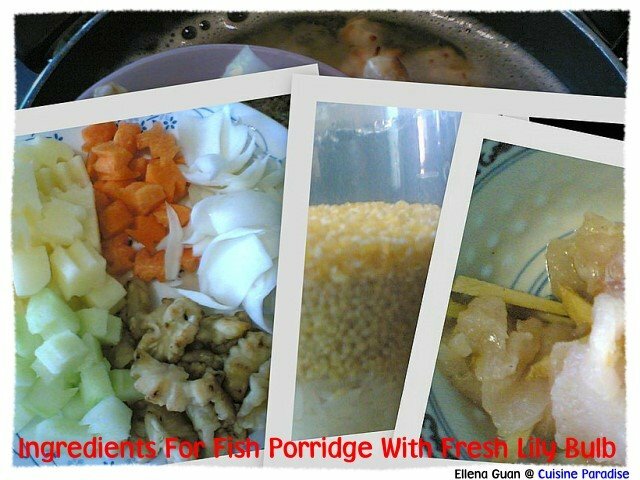 I decide to use it together with some other ingredients in the fridge to cook Fish Porridge With Fresh Lily Bulb. This porridge consists a few kinds of vegetables, walnuts, fish and fresh lily bulb which makes an appetizing and nutrition dish for toddler. Besides that I also mix in some yellow millet with rice to cook the porridge in order to boost up the flavour. 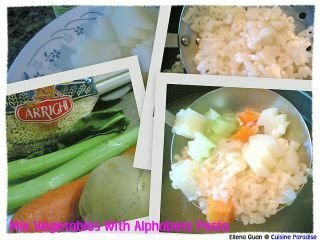 Make this Alphabet Pasta (ABC) with Mix Vegetables Soup for my boy this afternoon. He loves to eat this Alphabets Pasta as compared to Macaroni and he will request me to cook this at least once or twice a week. 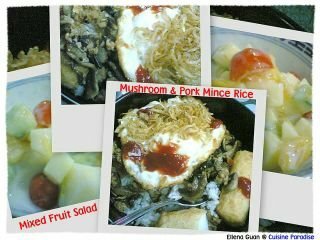 As for the ingredients I often add in dice potato, carrot and fishball. Today I try to add in another new ingredient which is known as Kai Lan (芥兰) stem since my son is picky with greens and the easier way to add them in his diet is through soup. This Fish and Tian Ma Soup (天麻生鱼汤) is a very nourishing soup for person with poor blood circulations and numbness in hands and legs. 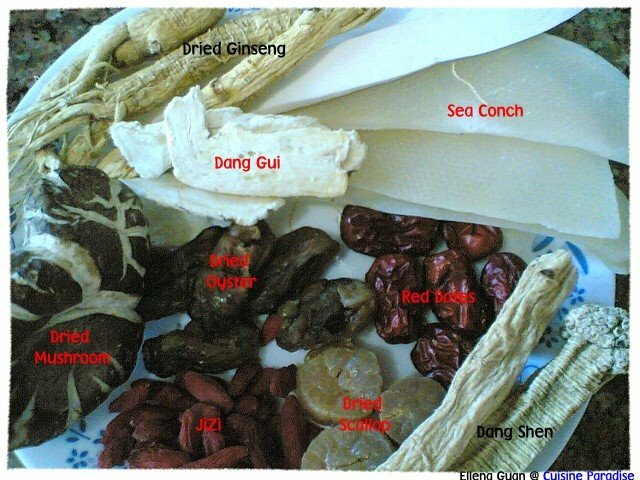 Besides the above, it can also cure coldness in the body with additional herbs such as Dang Gui, Red and Black Dates. 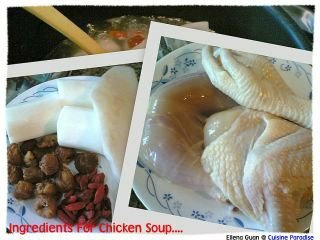 So if you feel giddy and numb in certain parts of the body, you can try cooking this soup twice a week to see whether it works on you. And sometime certain people needs to take more frequent before they can see the effect. Tried making this porridge twice by adding different ingredients such as minced pork, carrot, potato and walnut to cook with the mixture of Rice Grain (白米) and Yellow Millet (黄小米). And for this meatless recipe, I have added more vegetables to make it a healthier and nutritious porridge for young children. 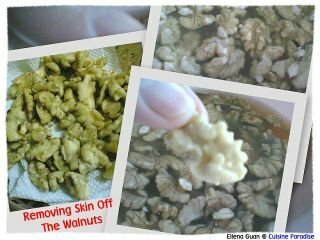 Although the most time consuming part is to remove the skin from the dry walnut but when seeing how much my boy loves the porridge I think it is worth the effort.